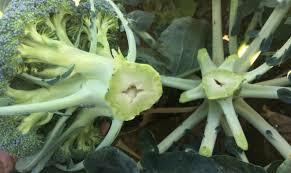 Ever seen hollow stems in your brassicas? Hollow stem is a physiological disorder which affects most brassica crops and often leads to the stem rotting by secondary pathogens. To identify symptoms of hollow stem you will notice small, elliptical cracks in the inner stem tissue of susceptible crops. These cracks enlarge and merge together as the stem grows, eventually forming a cavity. In severe cases, the cavity can extend the length of the stem and into the head. Often this cavity provides access for secondary pathogens to enter the plant, leading to discoloration and rotting of the inner walls of the cavity. However, having said that though, cavities can become discoloured without pathogens present. Hollow stem can be caused by a combination of environmental factors and crop susceptibility. 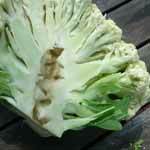 In general, larger, faster growing cultivars are more susceptible to this disorder. Wide plant spacing and high nitrogen or potassium levels have been shown to increase incidence of hollow stem. It has been suggested that hollow stem can be caused by a Boron deficiency in the soil. If you think this may be the problem with your brassicas, Boron can be added to the soil at the rate of 2 grams per square metre when planting seedlings. Boron is commercially available as Borax. What has to be made note of though, is that vegetables such as potatoes, tomatoes, french beans, celery and other cucurbitaceaes don't like Boron, so avoid growing them in soil that has had Boron added.